Grey Fox struggled against the robot, he could feel the grip tightening, his sword was just out of reach of his hands. Grey Fox had an epihpany (lol), He swung his body up and latched onto the robots arm, He then reached out with his leg and knocked the sword loose and to the ground. Grey Fox released the robots arm, and swung down, neck still being held rather tightly, He knew he only had a few more seconds. Grey Fox managed to grab the sword with his feet, He swung the sword upwards, stabbing the robot in the arm, the blade found its mark in a chink in the armor of the robot, Grey Fox initiated the electric shock on the sword, effectivly causing the arm to let go. However, He was shocked by the same charge. Grey Fox collapsed to the ground and began to crawl away rather slowly, picking up speed as he went. Mostly shocked the robot's legs had ceased functions. For a second, it struggled against the wall readjusting itself to have a clear slight at its opponent, crawling away from him. It took aim at the impaired target and rapidly began to shoot hot plasma from its razergun, covering the floor and walls of the small sewer with boiling streams of liquid death. Unaware of the desperate struggle beneath the streets, Ironhide drove through the city undetected, stopping to inspect an area of disturbance, where our fighters had previously entered the sewers. Driving up to the large hole left by the HELXAU-08-LUC-66, he transformed and entered the subterranean battlefield. Sadly, Ironhide's search did him little good. The voice of God boomed down from the heavens. "What the hell, people?" (He created it. Why would he care about saying it's name?) "I give you free reign to kill each other and you laze around and ignore even THAT! You know what? FINE! I'll find some OTHER desolate and morally depraved area to serve as a battleground." And so a mushroom cloud, the likes of which mortal man had only dreamed of (...and put into an insane amount of movies and video games) rocked the earth over the small town, wiping out its inhabitants and leaving a smoking, irradiated crater. It would make an interesting battleground, but that's an issue for another time. Welcome to the Amazon! No collections of humans for at least a hundred miles (the natives happened to heed God the first time. Their villages remain scattered about here and there). You happen to be somewhat off from two native villages and a ruined Aztec pyramid that may still hold a deathtrap or two. - Hazards: Harsh rains, wild animals, killer insects, the aforementioned Aztec deathtraps, and EACH OTHER! Slimer burst out from behind a now-empty banana tree. It was retro gaming... in real life! Pacman's Gaping mouth moved forward and consumed the deadly toxic looking beast, not knowing if it were healthy, nor really caring as he proceeded to munch down the surroundings. Slimer simply stood (floated?) there, as Pacman moved right through his incorporeal form. Now covered in slime, Pacman rammed head-first into a tree, dropping a round fruit onto his head. Luckily for him, it was just enough like a power pellet to power him up. 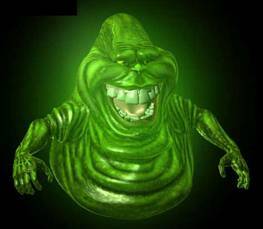 Slimer began to glow a strange blue color and suddenly looked very worried. He started floating away at a snail's pace.